Medical missions are organized so that volunteers address both the surgical and basic health care needs of the communities they visit. 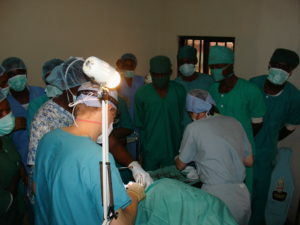 Surgical volunteers are divided into two teams and sent to two different hospitals to conduct screenings and provide care to as many patients as possible. Though their work depends on the skills of volunteers and the needs of their patients, surgical volunteers will often remove tumors, cysts, and abnormal growths, and treat various infections. Local medical practitioners often observe these procedures to improve their techniques. Nonsurgical volunteers such as general practitioners and nurses visit nearby villages to conduct basic health screenings, provide medical care, dispense medication, and teach health topics such as proper hygiene, nutrition, and disease prevention. Community outreach volunteers travel to different locations every day. Prior to departure, Imo Medical Mission hosts 4 teleconference calls as an orientation to prepare volunteers for their upcoming trips. In Nigeria, volunteers stay at a hotel in Owerri, the capital city of Imo State, and are transported to and from their work sites by bus. Volunteers work full days, often beginning at 8:30 a.m. In the evenings, volunteers usually attend dinners hosted by local community members and then return to their hotel to debrief on the day’s activities with their team. On each mission, volunteers are accompanied by several Imo State Medical Mission staff members who take care of all logistical arrangements and are available to lend assistance wherever it is needed. 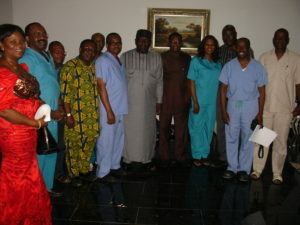 Oftentimes, trips include experienced volunteers who have participated in Imo State medical missions in the past. Repeat volunteers also assist in leading the missions and act as mentors for new volunteers. Each day, volunteers interact with patients and their families, either at their assigned hospital or in the villages they visit. 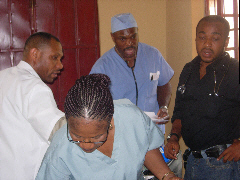 Surgical volunteers often interact with their medical colleagues to provide training and learning opportunities as they arise. Community outreach volunteers have an opportunity to meet and speak with patients from Nigeria’s rural areas. Additionally, prominent community members and government officials often extend dinner invitations to medical mission volunteers to show their appreciation. These dinners provide a chance for volunteers to try local food and speak with leading members of the community. Past volunteers were enthusiastic about the work they did with Imo Medical Mission, noting that they had been able to provide immediate medical relief to a large number of patients in need. Former volunteers highlighted the dinners they were invited to as culturally engaging experiences that were a welcome complement to their hard work in the hospital and villages. However, they also emphasized the need for medical mission volunteers to maintain a sense of flexibility in their work abroad, as they were often presented with challenging cases amidst difficult work environments. Age: All volunteers must be at least 18 years old. Skill: Imo Medical Mission accepts licensed medical practitioners and retired medical professionals from a variety of health care services. In the past, medical missions have included physicians, nurses, surgeons, dentists, medical or lab technologists, public health specialists, physical or occupational therapists, and biomedical engineers. Language: None. English is the official language of Nigeria. Other: Though not required, volunteers are encouraged to collect donations of medical supplies which are distributed on each trip. There are two medical missions every year: a 1-week trip in April and a 2-week trip in December. Imo Medical mission use fundraising and assistance from the Imo State government to cover the cost of lodging, meals, and in-country transportation. Volunteers must pay their own airfare, visa fees, and are encouraged to purchase immunizations and emergency medical insurance.